Up to 1 g of vitamin C in one tablet! 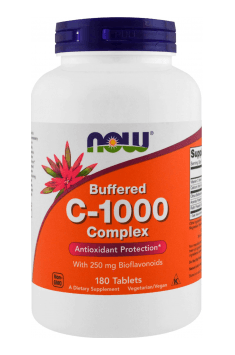 Now Foods Vitamin C-1000 Complex is a dietary supplement which contains 1,000 mg of vitamin C in a single tablet, enriched with calcium, acerola, rutin and citrus bioflavonoids, which complement its action. Ascorbic acid is one of substances crucial for the proper functioning of the human body system. It belongs to the vitamin group, which means that it has to be provided with food because the body system is unable to produce it by itself. Its action is the most effective when it occurs with phytocompounds which accompany it in nature, so the NOW Foods company complemented its supplement with a package of additional substances of greatest effectiveness. Vitamin C – an organic chemical compound of antioxidant properties. Next to the ability of transferring the free electron to free radicals, it can also restore the vitamin E resources. It plays a crucial role in the collagen synthesis, which is why it is important for the health of bones, teeth, skin and internal organs. Citrus bioflavonoids – a complex of antioxidant phytocompounds which are present in large quantities in citruses and show synergy of action with vitamin C. The most improtant are rutin, quercetin and hesperidin. Their action profile can be helpful in fighting problems with blood vessels and blood circulation as well as in case of asthma and allergy. Acerola – a fruit of the highest known vitamin C concentration, which amounts for about 3%, which is much higher than in case of a lemon, which is known for the presence of ascorbic acid. It is also rich in carotenoids, mainly in beta-carotene, which is a precursor to vitamin A, and anthocyanins, substances responsible for the intense colour of the fruits, showing extremely high health-promoting properties. Rutin – a flavonoid glycoside which shows synergy of action with vitamin C. It prolonges the action of ascorbic acid, due to the slow down in its oxidation, and supports it in the reduction of oxidative stress. Moreover, it can also strengthen capillaries, protecting them from fragility and breaking. Calcium – a macroelement essential for living. Large amounts of it are used for strengthening bone and teeth structures, and this is the most common reason for using calcium supplements. It supports energy metabolism, participates in blood coagulation, supports muscle and digestive enzymes functioning. It affects water management and helps to maintain the proper neurotransmission. Collagen is a protein structure, which make tissues elastic and flexible. Its deficiencies make the tissues fragile and weaker, which can cause various problems. One of the factors necessary for the maintenance of the optimal collagen synthesis is the proper uptake of vitamin C. So it is worth to provide the proper amounts of ascorbic acid if we observe breaking blood vessels, bones and joint pains or unsatisfying skin quality, which is not elastic enough. Using vitamin C in the first days after observing disease symptoms can reduce the time of treatment in both children and adults. Vitamin C shows the highest effectiveness in case of people exposed to excessive organism burden, including athletes who train intensively. Supplementation with vitamin C in the period of increased training activity can significantly reduce the frequency of diseases, which prevents standstills in trainings resulting from the infection treatment. Vitamin C is one of the basic vitamins, and its influence on the human body system is quite wide. It can activate particular enzymes involved in biochemical transformations. Due to this it affects i.a. tyrosine transformations, which is used for the production of dopamine and thyroid hormones. It participates in the production of other neurotransmitters and corticosteroids, which are used i.a. to control inflammations. The most common and the most serious results of deep deficiency of this vitamin is scurcy which is a medical condition whose symptoms are ulceration and bleeding of gums and tooth loss. It may also impair collagen production which negatively affects cartilages, joints and skin elasticity. Further results are slow wound healing, fragility of blood vessels, low immunity and general weakening of the body system. Now Foods Vitamin C-1000 Complex is intended for people who want to improve resistance to colds, especially for athletes. It can also be effective in case of problems with cardiovascular system and blood vessels fragility. The supplement is also recommended in case of low elasticity and firmness of skin accompanied by joint pains. Vitamin C-1000 Complex 180 tab. Vitamin C-1000 Complex is a vitamin C supplement of optimized action and absorption. Thanks to that one tablet is perfectly enough in most cases, both as a preventive healthcare and in case of collagen synthesis improvement, blood vessels protection and energy metabolism support. Higher doses are recommended only if we observe first symptoms of a cold, to prevent it from further development. Then it is recommended to take vitamin C throughout the day, with the total dose of 5 tablets. Active athletes should avoid taking the supplement short before or after traning, as it can reduce training adaptation. The optimal interval between the supplement and training is a few hours (before or after). The increased demand for the vitamin was observed in elderly people, smokers, alcohol abusers and people taking drugs. The recommended daily supply of vitamin C amounts for 100–200 mg and in most cases it is provided with food. In case of a cold, infections or when we want to support the immune system, we will need a higher dose. It has been demonstrated that a dose of 2 g a day (2 tablets) can reduce the symptoms of a cold or shorten its duration. In case of general preventive healthcare, 1 tablet a day will be perfectly enough. It is important to remember that vitamin C is water-soluble so we should take it with water. Moreover, the vitamin increases the bioavailability of iron, so it is recommended to take it with a meal containing this element, which is especially important in case of vegetarians. Cellulose, Stearic Acid (vegetable source), Magnesium Stearate (vegetable source), Silica and Vegetarian Coating. Advanced Lipid Control supports healthy cholesterol levels and safeguards vascular and heart health. Beta-glucan delivery formula that improves immune system functions. Vitamin K2 MK-7 from GMO-free fermented natto soy. Responsible for normal bone mineralisation. Reishi is believed to promote health and wellness, sometimes called "the mushroom of immortality". Maca root extract. It promotes fertility and sexual desire, adds energy and increases mental abilities.